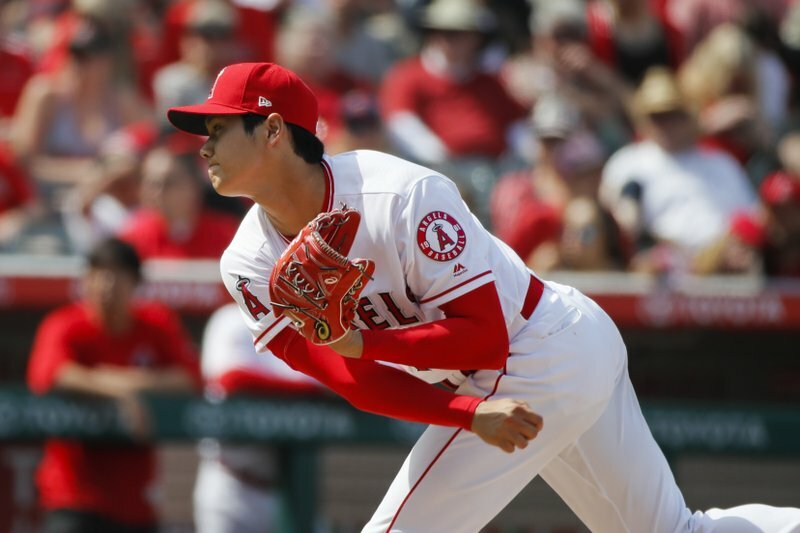 Shohei Ohtani seemed to be the only person in Angel Stadium who wasn’t incredibly impressed while he mowed down the Oakland Athletics’ first 19 batters in order. But when Ohtani finally yielded a hit and then struck out Matt Olson with two runners on to end the seventh inning, he gave a fist pump and a celebratory scream at the ground while the crowd rose for a standing ovation. Even the two-way Japanese sensation realized his first home pitching start was a thrilling moment in his increasingly incredible rookie season. Ohtani threw seven shutout innings of one-hit ball in his home debut on the mound, propelling the Los Angeles Angels to a 6-1 victory Sunday. Marcus Semien’s clean one-out single to left broke up Ohtani’s bid for a perfect game, but he finished the inning with his 12th strikeout. Mixing 99 mph fastballs with precipitous breaking pitches and tremendous professional cool, Ohtani (2-0) was too much for Oakland — until the seventh, when he showed resilience, too. Ohtani struck out the side twice during the latest feat in a series of early season superlatives by the 23-year-old prodigy. He won his pitching debut in Oakland last weekend with six strong innings, and he homered in three consecutive games in Anaheim between starts in his attempt to become the first regular two-way player in decades. He was sharp from the beginning on a gorgeous day in Orange County, striking out the side in the first inning on 15 pitches. Ohtani struck out the side again in the fifth inning, and he fanned every Oakland batter except Jonathan Lucroy at least once. Jed Lowrie drew a four-pitch walk after Semien’s single, but Ohtani ended the threat by inducing Khris Davis’ weak groundout before fanning Olson. He left the mound to the last of several standing ovations from his enthralled new fans in the sellout crowd — an unheard-of gathering at Angel Stadium in April. Kendall Graveman (0-2) gave up five hits and four walks while failing to get out of the fourth inning for the A’s, who have lost seven of 10. Matt Joyce homered in the ninth. Trout scored his 700th run in the first inning on Pujols’ double down the left-field line. Trout joined a club of nine players in baseball history, including Pujols, who had 200 homers and 700 runs scored before their age-27 season. Trout hit a long homer over the ficus trees in center field in the third inning, snapping an 0-for-15 skid on Los Angeles’ homestand. The two-time AL MVP added a bloop RBI single in the fourth to chase Graveman. Athletics: Oakland put OF Boog Powell on the 10-day DL with a right knee sprain in a move retroactive to Saturday. Mark Canha was recalled from Triple-A Nashville. Powell will return to Oakland for an MRI on Monday. He was injured Friday, when he crashed into the wall and later got his spikes stuck in the dirt while running the bases. Angels: Los Angeles put a starting pitcher on the DL for the third time this season, leaving the club with three starters and 10 relievers on its 25-man roster. J.C. Ramirez went on the 10-day list with a right elbow strain after lasting just two innings and walking five A’s in his loss Saturday. Athletics: After a day off in Los Angeles, Sean Manaea (0-1, 1.15 ERA) takes the mound at Dodger Stadium to open a two-game interleague series. He threw eight innings of stellar one-run ball against Texas in his last start. Angels: Garrett Richards (1-0, 5.06 ERA) takes the mound Monday when Los Angeles opens a road trip against the Texas Rangers. The long-injured righty hasn’t pitched against the Angels’ AL West rivals in Arlington since May 1, 2016.